The Food Network has announced that season seven of Trisha’s Southern Kitchen is scheduled to premiere Saturday, January 2, 2016, at 10:30am ET/PT. 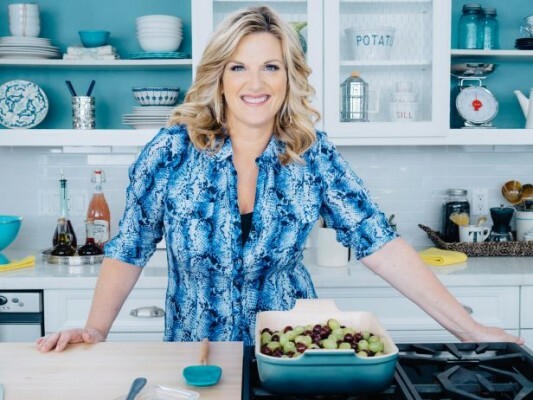 Country singer and cookbook author, Trisha Yearwood, hosts the how-to cooking show. Episodes feature Yearwood, cooking with and for family and friends. Reba McEntire will visit during season seven, which also includes a trip to Elvis Presley’s Graceland, and a Habitat for Humanity build. NEW YORK – December 7, 2015 – Grammy-winning(R) music superstar and best-selling cookbook author Trisha Yearwood is celebrating 2016 with new episodes of the Emmy-winning(R) series Trisha’s Southern Kitchen, premiering Saturday, January 2nd at 10:30am ET/PT. With a trip to the Country Music Hall of Fame and down-home dinner with Reba McEntire, a Graceland visit honoring Elvis Presley with Banana Pancake Sandwiches and a Habitat for Humanity build, season seven is jam-packed with delicious food, beloved family and friends and special moments in the kitchen and on the road. The thirteen-episode season also features Trisha’s lighter take on favorite Southern dishes, game-day party food and a nostalgic “Barbie Q” with Trisha’s sister Beth. In the premiere episode, Trisha is being honored with the ASCAP Voice of Music Award and she starts the day eating light with a Peanut Butter and Banana Breakfast Smoothie, then heads to a wardrobe fitting with a Whipped Sweet Potatoes snack. During lunch, she gets hair and makeup ready while preparing a Chicken Salad with Homemade Herbed Crackers. After the awards ceremony, Trisha indulges in a decadent Chicken Salad, Avocado and Cheddar Panini and a quick Chocolate Cake in a Mug for dessert. In the following episode airing January 9th, Trisha takes a day trip to Memphis in honor of Elvis Presley. With her friend Julie, she visits Graceland, Sun Studio and makes a Banana Pancake Sandwich filled with Peanut Butter Maple Syrup spread to pay homage to the king. They also make other Memphis-inspired dishes including Tamale-Style Pulled Pork over a Cheesy Grit Cake, BBQ Pork Nachos and an indulgent Vanilla Milkshake with White Chocolate and Peanut Covered Straws. Want to try out Trisha’s Southern-style meals at home? Find her recipes, watch highlights from the show, tour her Nashville kitchen and go behind-the-scenes at FoodNetwork.com/Trisha, and join the conversation on Twitter using #SouthernKitchen. Trisha’s Southern Kitchen is produced by Magical Elves. Are you a fan of the Trisha’s Southern Kitchen TV show on the Food Network? Do you plan to watch the seventh season? Have you tried any of Yearwood’s recipes? Tell us in the comments. More about: Food Network TV shows: canceled or renewed?, Trisha's Southern Kitchen, Trisha's Southern Kitchen: canceled or renewed? This is the worst cooking show. Trisha has a dull personality so has her sister, a friend, her manager, her husband, etc. join her on the show. And together they act like idiots. They make stupid remarks while trying to be funny. Its hard to watch. Relax and stop making the same stupid, unfunny comments over and over again. No one cares. Some of her recipes look interesting but I have to turn it off because she is so annoying to watch. Is the show cancelled? Good. Sorry, but stick with singing. I feel.the same way. I wish they would Get Rid Of The Game SHOWS Too. Can learn anything from them. I am a fan of her singing but not her cooking. I haven’t learned anything from her. Her recipes are, to me, bland and boring. I want to learn something and be challenged to try new recipes. I do love Ina Garten, Bobby Flay, Michael Symon, Giada, and Alex Guarnaschelli among many others on Foodtv. I couldn’t disagree more. I am from the South and enjoy seeing southern cooking showcased. It is about time. I have made some of her recipes and they’ve turned out very delicious … Thank You Trisha!!! I love watching her show she is so down to earth. This show is awful and she is not a good cook period. Food Network needs to wake up. These recipes are NOT healthy and they are out of date. I love this show and Trisha. She makes meals we all have the ingredients to make, not things you have to buy that are $8.00 and you only need a teaspoon . Rena. These recipes are so dated and awful. She cannot cook. You apparently like unhealthy poorly made food because this is what it is. TOO much fat, overkill on the sugar etc… If you want to waste food then make her recipes or should I say Grandma Lizzie’s. They are NOT good. Growing up in the South I relate to Trish’s cooking. She cooks the way my Mom cokked and the way I coined for my children. Believe it ir not Trusha cooks what most if us can afford to cook. She is a great cook and I have used many of her recipes. If you are looking for Haute cuisine then watch another show. I love Trisha’s cooking show! Her recipes are like my own style of cooking where the recipes have been handed down from previous generations. Her down home personality makes watching the show enjoyable. Trisha’s concert in the beginnings of her career in Fort Worth was one of the first concerts I had attended! It would be so much fun to meet her! I really enjoy the show and the recipes. She’s true to life and not artificial. Please don’t take her off. She’s a plus to your network. What happened to Trishas kitchen? Did she move or is it new? I love that Ms. Yearwood’s recipes are easy enough for me to make and taste great. That’s how I feel, Sherry.